Jeff Murrell | Tough, experienced, affordable Wisconsin Attorney. How to find a good lawyer in Milwaukee! Click a category below for details! Greetings, and thanks for visiting my web site! I've been practicing law since 1995, and I love what I do. I love my work because I thrive off of helping others. Though the money is certainly nice and provides a very comfortable lifestyle, I did not become an attorney to get rich - I became one so that I would have an interesting livelihood with which I could validate my own existence in the universe by doing meaningful things for folks in need of help while fully utilizing all of my language and "people" skills. Unlike a lot of other attorneys, I take the time to provide my clients such quality services as making house calls (not just for the sick or elderly), and I personally return each and every client's telephone call and e-mail reasonably promptly, if not immediately. With the exception of bankruptcy-client cases, no one ever touches my files but me. I do have people helping me out at any given time with the administration of my law practice, but only my hands touch my non-bankruptcy files. I am the only one who drafts my criminal-defense and family-law clients' paperwork, not some paralegal. When a client retains me to handle his or her case in court, I am the one who goes to court for that client, not an associate attorney working for me. And I am the one who is in charge of taking and answering my telephone messages on my direct line. I do everything myself for my clients because modern technology allows me to, and because past experiences have taught me that letting somebody else do work on my cases can lead to sloppy carelessness below the high standards that I adopted from half a decade of military service during the cold war. I realize that what I do for people is very serious business; I take each and every client's case equally as seriously, no matter how much or how little is at stake for each one because everybody's case is important. Another reason that I can do everything for my clients myself and take such good care of them personally is because I am very selective with the number of legal matters that I take on at any given time, unlike other lawyers I know who pile so many cases onto their desks that they end up spreading themselves far too thinly to give their clients the close attention, care and results that I give mine! Click HERE to read a few newspaper articles about some of my legal victories. Also, click here to read a poem that one of my actual clients has published on poetry.com about the quality of the service and care I provide. My legal areas of practice focus on criminal law (federal/state felony & misdemeanor defense - all levels), debtor law, most family law matters divorce, child support/custody, paternity, prenuptials), defense against and prosecution of certain civil-law causes of action in state and federal courts, bankruptcy and bankruptcy alternatives, small-business/professional licensing application denials/appeals (for municipal liquor licenses, state-granted professional licenses, etc. ), some personal injury, school board hearings, simple wills and a smattering of other things (just ask me). I am trial certified by the Wisconsin SPD's office to handle all felonies (attempted Class-A), all misdemeanors, paternity, Chapter 980 cases, Chapter 51 & 55 psychiatric commitments (dormant certification), all juvenile, including termination of parental rights, and probation/parole revocations. I was also certified/qualified by the Federal Defender panel in Wisconsin for federal felony and misdemeanor cases. Geographically, I take Chapter-128 debtor cases from all over the state, and I accept criminal-defense, family law and other cases primarily from the following counties: Milwaukee, Waukesha, Washington, Racine, Kenosha, Ozaukee and Sheboygan. I also accept federal criminal cases in Dane County. Click the image above to read my May, 2008 feature article about Ch. 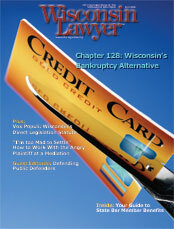 128 debtor actions in the official publication of the Wisconsin State Bar. I am only the third lawyer in history to publish an article about this law! Click above to read my May, 2009 feature article about liquor licensing in the official publication of the Wisconsin State Bar. published in the 2010 Winter/Spring edition on line and in print of Wisconsin Defender, the official publication of the Office of the Wisconsin State Public Defender! Back when I started law school in 1992, we were taught that it is unethical for an attorney to expressly claim to "specialize" in any area of legal practice except admiralty (maritime) and patent law. The old ethics rule prohibiting lawyers from making such claims was in part intended to prevent attorneys from misleading people into falling victim to the very easy assumption that one who "specializes" in an area of law is necessarily certified as competent in it to help the general public. Practitioners out there who practice solely in one area of the law should not be presumed to know more about that area than any other attorney, including those who practice in more areas than the one in which you currently need help. We are all required to maintain the same, minimum standard of competency in any areas we practice by attending mandatory continuing legal education courses, by associating ourselves with more experienced attorneys and through on-going self-study. There are a number of reasons why some lawyers only practice in one area - many simply have no experience in any other area besides the one claimed as a specialty. Saying that one specializes in an area of law is no guarantee at all that the lawyer is competent and more on top of his or her game than anyone else. An attorney who practices in more than one area is in fact able to provide you more thorough advice, is better able to plan for contingencies and is more able to provide you assistance in complicated situations which ride the line between two or more areas of legal practice. Think about it (and click HERE to dispel some other myths about lawyers that you may have heard before). Every former prosecutor I know against whom I at one time had to defend clients who has since jumped the fence to defend the criminally accused was relentlessly, unreasonably heavy-handed as a prosecutor. What would make anybody think that someone who chose to start his or her career prosecuting people and making their lives hell would be able to simply flip a switch in his or her brain such that he or she could then thoroughly and sincerely advocate for the best interests of people charged with committing the same crimes he or she once zealously prosecuted? Once a prosecutor, always the prosecutor's mentality! If you're thinking about hiring a former prosecutor to defend you in a criminal case, instead of a career defense attorney, like me, then ask him or her a few questions first: Why is the attorney now defending the criminally accused when he or she started out prosecuting them? What's your guarantee that he or she will really be looking out for your best interests and will not let old instincts inadvertently take over to the point that you get "sent down the river without a paddle"? If he or she says it's because the money is better, run (don't walk) out of his or her office, then call me. Some former prosecutors I know who are now defense attorneys have themselves been busted for drunk driving and shoplifting (can you believe that? ), so they had no choice but to leave the prosecutor's office. Without practice experience in other areas of the law, they are forced to resort to doing criminal-defense work (it's not hard to imagine that they really don't want to be doing what they do now). So do you want one of them defending you? That's something else to think about! I expertly draft legal documents (Premarital Agreements, Powers of Attorney, etc.) and provide legal consultation in Spanish and French for both clients and other attorneys. I have been speaking these languages (and others) since my late teens, honing my degree of fluency in each through on-going study and on-the-job work experience at both the state and federal levels of government. Though my skills as a negotiator result in the satisfactory resolution of over 90% of my clients' cases for them short of having to go all the way to a trial or other applicable form of final evidentiary hearing, I have litigated my fair share of both bench and jury trials over the years and won most of them. I attribute much of my success to the uncommonly good fortune I had during my first few years of lawyering, when I gained a wide, yet detailed base of practical courtroom experience working for a full-service, general law firm in downtown Milwaukee, Wisconsin. That started for me in 1994, right after I served a one-year judicial clerkship with a Milwaukee County Circuit Court Judge on the civil bench. After graduating from Marquette University Law School, I was admitted in May of 1995 to the Wisconsin State Bar - I am also admitted to practice in both the U. S. District Court for the Eastern District of Wisconsin and the U. S. District Court for the Western District of Wisconsin. After serving for a while as an associate attorney at the downtown law firm where I first started out back in '94, I declared my professional independence on July 4th of 1997 and hung my own shingle in Milwaukee helping clients throughout the state in the Spanish, French and Russian languages (as well as in my native English, of course). My unique and lengthy experience encompasses familiarity with practically every level of litigation within nearly every municipal, state and/or federal court, hearing board and judicial governmental agency in southeast Wisconsin. I have built an extensive personal and professional network with other lawyers, judges, law clerks, other legal professionals and forensic experts in many areas of the law. My experience earned me a place on both the State Public Defender's private-bar appointment list for top felonies and the state's highly-selective CJA Federal Defender Panel (the latter appoints criminal cases in both the Eastern and Western Federal Districts of Wisconsin; in addition to having regularly accepted appointments in years past to represent indigent defendants from the State Public Defender's office, I routinely accepted for over 20+ years appointments to represent indigent CJA clients in federal felony-level cases in partial fulfillment of the pro bono obligations recommended by Wisconsin's Code of Attorney's Professional Responsibility). Again, I personally handle every client's file and telephone calls myself. If I'm out, just call my cell phone at (414) 218-3906 and try to reach me there. I'm the one who checks my voice-mail messages and replies to them when I return (not an associate attorney or other legal assistant). I like to stay in very close contact with every client, especially those who are located elsewhere; next to the telephone, Internet e-mail is one of the best tools I have found for communicating with clients (as any of my current or past clients can attest to, it is not unusual for me to e-mail at odd hours of the morning or night, and during weekends). I am able to convert most documents into files which I am then able to provide a client as an e-mail attachment (I'm a "green" lawyer!). I understand that people can be very busy sometimes. But if a client fails to maintain regular communications with me, it can become next to impossible to effectively represent him or her. Anyone who retains any lawyer on a case has to keep in touch with him or her on a regular basis and respond to his or her communications. If a client fails to maintain a reasonable degree of contact with his or her attorney, the attorney might have to formally withdraw from the case (and nobody ever wants that). MY FEES: REASONABLE UPFRONT RETAINERS AND/OR HOURLY BILLING! The vast majority of people who have contacted me for help over the years have had trouble coming up with a lot of money to pay me upfront for my services. So, in order to make my services most affordable for people, I can offer my clients the choice with many types of cases of either paying me a single, upfront flat fee or having me bill them by the hour, or a combination of both types of fees. With the flat-fee choice, I can normally work out a monthly payment plan where a client pays a portion of the quoted fee down/upfront and the rest of it through monthly payments, should a person not be able to pay me the entire quoted flat fee upfront. Otherwise, I charge $250 billed at 10th-hour intervals/increments for family-law and criminal-defense cases, and $275 billed at 10th-hour intervals/increments for all other types of cases (except Ch-128 cases, for which I offer a number of flexible, affordable flat-upfront payment options). I bill my clients at the hourly rates via email only after I've completed work for them after each week in which work is performed. The average number of hours billed each month for each of my clients is between two and six. That said, paying me the agreed on flat fee may actually be least expensive for a client in the long run, depending on the complexities of the case. Active-duty military personnel not only get free consultations, but 10% off my quoted fees. Also, for a processing fee of 4%, I can accept credit- or debit-card payments over the phone if you have a Visa, MasterCard, American Express or Discover Card. If you want to pay by phone, then email me your name and telephone number, and I’ll call you. Afterwards, I’ll email you a receipt. Note that I do not hold, record or otherwise keep any of your card information. Relocated to Wisconsin in July of 1992 from New Orleans, Louisiana. Married to the most wonderful woman in the world, Dorothea Murrell. Hobbies/pastimes include attending area art exhibits and other art-related things, collecting kitschy, retro glassware, cooking spicy foreign and domestic cuisine (especially Cajun/Creole - click HERE for some of my favorite recipes), biking around scenic Milwaukee when the weather permits, and traveling abroad. Please let me know if I can do anything for you. I give unlimited, free telephone and e-mail consultations for a variety of legal matters to people who have cases for which they might need an attorney to represent them in Wisconsin. Call or email me anytime if you need help! I was selected as one of the top 100 family lawyers out of all those practicing in the State of Wisconsin by the American Society of Legal Advocates. 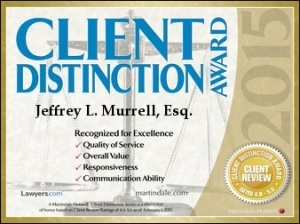 And I was selected by my clients as one of less than 1% of attorneys throughout the U.S.A. to receive Martindale-Hubbell's prestigious Client Distinction Award in a variety of categaries, including communications ability, responsiveness, quality of service and value for money. I was also chosen by The National Trial Lawyers for membership into the top 100 criminal-defense lawyers in the state of Wisconsin. I maintain an A+ rating with the Better Business Bureau!